This Saturday, December 14, Stealing Sheep will be hosting their Christmas party, but rather than a regular old gig adorned with tinsel and a light dusting of fake snow, they've gone all out and are embarking on Mythopoeia, a series of fantastical nights featuring musical collaborations, puppets, costumes, dancers and visual arts. 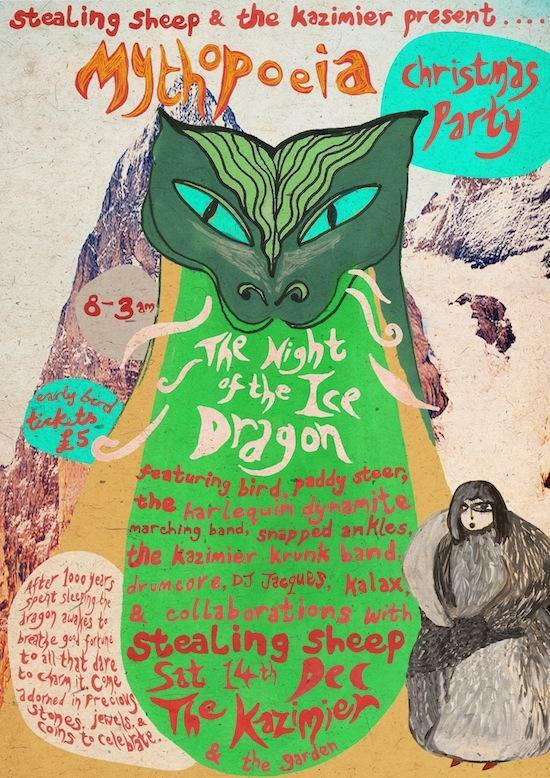 Saturday's edition is called Night Of The Ice Dragon and has the band putting a number of friends and guests on the bill, including Snapped Ankles, The Kazimier Krunk Band, Kalax, Drum Core, DJ Jacques, B!rd, Paddy Steer and The Harlequin Dynamite Marching Band. Ahead of the event, taking place at the Kazimier - get hold of tickets here - we asked the band's Becky Hawley to fill us in on what we could expect. Firstly, what can we expect at Night of the Ice Dragon? Becky Hawley: We're just sewing multi-coloured pom poms and sequins to some dragon soul costumes. Lucy [Mercer]'s been making light up stalagmites and we've got lots of friends offering their expertise making puppets, dances and music. The Kazimier club is an amazing space to work with and we're taking over three sections including their new winter garden. Why is the dragon awakening from his slumber? Should we be scared? BH: The dragon is based on a lot of Chinese folklore, but we've channelled that into our own imagining. This dragon is an icy dragon that has slept for 1000 years. With the offering of pearls, precious stones and golden frills our guests will reap the fortunes he offers them when he awakes. Wikipedia tells me "mythopoeia" involves the creations of myths: what draws Stealing Sheep to myths? What kind of myths will be created at Night of the Ice Dragon? BH: We got the word mythopoeia from Tolkien. He created his own universe and characters with back stories and fables. We've always been interested and inspired creatively by inventing our own environments and characters. It's gives us ideas for music too. We're experimenting with lots of these ideas in the show and collaborating with some local musicians like The Harlequin Dynamite Marching Band and Paddy Steer to help make our characters and stories come to life. How did you choose the performers, musicians and artists we can expect to see at Mythopoeia? How important is it for you to support local talent from Liverpool? BH: We're fortune that there are some really interesting musicians and artists in Liverpool and Manchester, and everywhere. The musicians we're working with for this night are people we've admired from afar for quite some time so it's really exciting to get this excuse to play with them. What are the plans for the next Mythopoeia nights? BH: We're going to keep experimenting with our ideas and getting more collaborations on board. It's been brilliant for scouting for new unusual bands and we've already discovered some bands we'd like to invite to play the next one!